Thank you for visiting with us at the Today's Dietitian Symposium. We found this engagement a perfect recipe of knowledge sharing, enlightened conversation and of course — food! As Registered Dietitians, our common goal is to provide the best information to encourage healthier living through food and nutrition. At Monsanto, we play an important role in developing the seeds that support farmers who grow fruit and vegetables for consumers. Therefore, we featured our Honeysuckle™ Sweet Red Onion as an unexpected addition for boosting produce consumption. 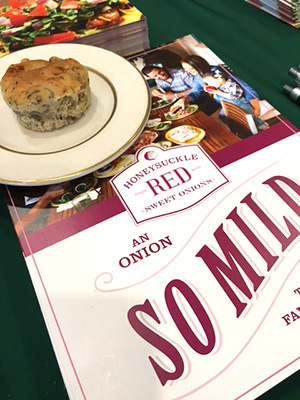 We were delighted to see that the savory Honeysuckle™ Red Onion, Dill and Walnut muffins were such a hit. In case you missed it — here is how to make a batch of your own. These tender, savory muffins are the perfect accompaniment to scrambled eggs at breakfast or a soup or salad at lunch. Line muffin pan with foil muffin cups. Do not use paper muffin cups; the muffins will stick to the paper. Toast walnuts on a baking sheet for 5-7 minutes. Combine milk, egg, and melted butter in a large bowl. Whisk to combine well. Add onions, toasted walnuts, cottage cheese, and dill; stir to combine. Add flour, baking powder, salt, and sugar, stirring only enough to dampen the flour. Batter should not be smooth. Spoon batter into muffin cups, filling each cup nearly full. Store muffins in an airtight container at room temperature for a day; after that, refrigerate. 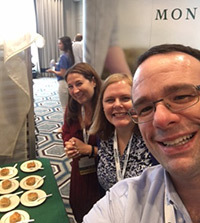 As an ag company, we enjoyed the educational focus on food systems and agriculture. With consumers taking a larger interest in how food is produced, it is important to understand food facts around GMOs, pesticides and sustainable farming, so people can feel good about the foods they are feeding their families. With early research showing consumers choosing not to eat fruits and vegetables out of fear, RDs are best suited to help consumers break through the marketing and hype. We would like to share some additional resources, including our Leaders Engaged in Advancing the Dialogue Toolkit and Let's Dish! 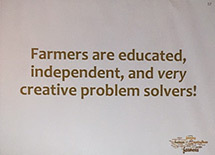 The Facts on Food and Farming. In the toolkit, you will find information and communication tools, such as PowerPoint presentations, infographics and links to resources on many of the topics trending in food production, including GMOs, pesticides and the differences between organic and conventional farming. Let's Dish! The Facts on Food and Farming contains first person perspectives on sustainable agriculture and meeting the needs of a growing population. To keep the dialogue going, reach out to milton.stokes@monsanto.com or follow him on twitter @MiltonStokes. Thank you for joining us at the Today's Dietitian Symposium. We look forward to seeing you at #TDinAustin 2018 and continuing the conversations on food and agriculture. © 2017 Monsanto Company — All Rights Reserved.